Thank you for downloading brochure. The key feature of Edwao - digital campus management software; It is a Web based intuitive user interface system with pioneering features to maximize school management. Edwao management system, invites more applicants online and simplify the admission process, attendance reports, performance reports, fees mangement and much more. Parents can get updates regarding their child's performance and makes chaotic schedules, stress-free and easy to manage enthuses student performance and success. We integrate many features that helps to control your school management system in a unique platform with simplicity. Our software automates the management process of an institute from student admission to examination management, from course management to schedule management. Edwao's management system allows to manage the admissions of all the students easily along with student’s basic details, family information, previous school details, transfer and birth certificate and report card with passport sized photo. It also helps to manage employees attendance sheets, class & coarses distribution, salary management and many other usefull programs of an educational institute. With Edwao management system, you can create & manage shifts, track every employee’s in/out time, students attendance, record employees work-from-home/out-duty attendance. Our system comprises all details regarding fees such as fee submission, advanced fee, hostel fee, refund of academic and hostel fee. 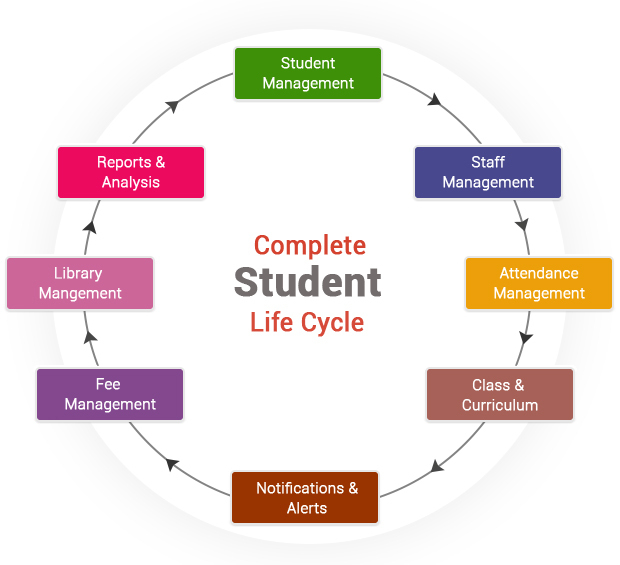 Edwao management system manages: class capacity report, new admission list report, left out students report, student strength, attendance status. System helps to store and displays the details of all staff members (teaching/non-teaching) of school. The details include personal, education, experience, family, department, performance etc. Edwao management system fascilitates to manage courses, Adding/Editing/Deleting courses, batch creation, manages multiple courses, manage batches, runs unlimited batches for every course, temporary batch creation and many more. This software allows generating, maintaining and monitoring timetables, also track and control attendance with speed and ease. Our system provide powerful tracking of attendance with external gadgets, solution for access control and manage staff at every access point. Edwao management system also provide text message notification to parents about the students study, fees and any announcement related to their school/college. Give Access to Students, Parents, Teachers, Accountants..